Welcome to 2019! Hard to believe we are already in January 2019. I know it is always this way as we wonder where last year went and what is in store for the new year. With the start of the new year, it is also time to debut the new 2019 Winter Pairing menu. We rotate the menu every three months to keep things fresh, local and seasonal. Besides, it's always neat to anticipate and then experience what new and different ideas Chef Cook has for us to enjoy. This menu is no different. 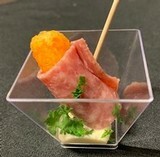 To provide a little bit of a spoiler, we get to enjoy puffed Cheetos... wrapped in salami and dipped in an incredible avocado aioli paired with the 2016 Texas High Plains Merlot. Chester will be proud to see his snack elevated in ways unexpected! We are sometimes asked why we go through the effort to provide wine and food pairings. The answer is two fold: First, in our opinion, wines are best experienced when surrounded with friends, food and family. They facilitate community and conversation. Gathering around the table is the foundation of our food culture and traditions. We find ourselves connecting and reflecting. Wine helps us slow down and appreciate the bounty in our lives. how many times new friendships are made or old ones are rediscovered by happenstance in the tasting room. That is what it is all about! We are pleased to facilitate this experience and have our wines be part of something special. Second: growing and making wine takes a long time. Our red wines age around 30 months between harvest and release. KanKar, one of our flagship wines, takes about 38 months from harvest to release. So, let's not be in a hurry to slam down a wine-shot and race down the road. Instead, let's slow down, sit down, relax and savor. It is worth the effort. The new menu will run until the end of March. This gives you plenty of time to find a day to reserve your tasting at the estate taste the wine and food bites. Don't forget, we also list out all the past pairing menus on the website, should you want to remind yourself of prior bites and perhaps new ideas for your own culinary adventure! See you at the estate soon. We bottled the 2016 KanKar this week. Don't get too excited. We won't be releasing it until September, 2019 - or another 10 months from now. Patience! The 2016 KanKar will take about 36 months from harvest to release - 3 years. While we would all love to open that beautiful wine today, the simple fact remains: fine wine takes time. For example: We invested over 5 years to release the first Estate wines earlier this year. Much of that time was converting the land from a coastal field to a vineyard and then farming the land and tending the vines, nurturing them to health and harvest. Fortunately, the first wines are whites and rose, since those "only" take about a year to produce post-harvest! It is one reason we love our tasting experiences so much: we all get to slow down and savor the literal fruits of our labors. 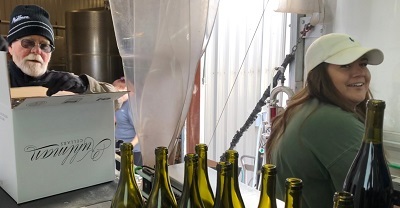 Modern conveniences and machines now exist to speed up the winemaking process; however, the consequences of rushing and pushing are, in our opinion, to the detriment of the quality and character of the wine. For us and our winemaking philosophy, only hand tended wines with ample time provides the optimal path towards excellence! After all, once the wine is in the glass and you experience the exceptional quality, can we reflect and realize the time and effort are worth it. So, as we look to the end of the year and the promise of the new, let's slow down and savor with our community and family. Open the older wine and enjoy the graceful aging which time brings. Enjoy wine with friends, family and food. And we can wait awhile longer with anticipation as the younger wines continue their path of maturation. 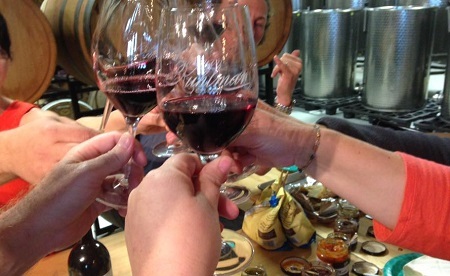 What an incredible ride it's been since October 3, 2014 when we opened the doors and officially launched Kuhlman Cellars: It hardly seems like it’s been four years! It's funny how time and events evolve over the years. When we opened, the rustic dirt entry road led our guests to the parking lot and the lone structure we now call ‘the barrel room’ had triple duty for wine production, storage and tasting room. 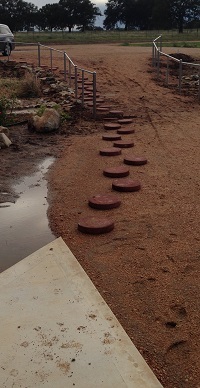 Vineyard infrastructure was still being installed such as irrigation piping, end posts and wire; while the rough "path" to the front door consisted circular paver stones from Home Depot! On that first highly anticipated Friday, we anxiously threw open the doors to welcome our guests... and well, no one came on that first day! We realized that having a sign on 290 would be helpful, so that came a few weeks later. Our winery vision and inspiration has been constant: elevate the wine and hospitality experience of Texas wine. We want to drive wine quality improvement and innovate an unparalleled tasting-experience. I feel we’ve achieved (and continue to innovate) our goals on both fronts. 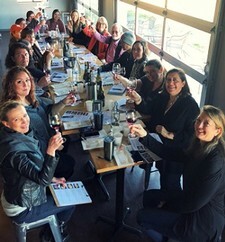 More importantly, we've built a wonderful team committed to enhancing the community and sharing our passion for wine. Vineyards take a lot of work and operate at the speed of life... as such, so do we. We've built countless friendships, been a part of engagements & marriages, moves both long and short, life events, new jobs and expanding families: for that we are boundlessly grateful. Thank you to all who've been part of our story, because this is what it is all about: community. Wine is the center-piece of all that comes from motivated work and appreciation of the finer things. It's not instant and it isn't easy, but the rewards are immeasurable. In the end, we rediscover what matters the most when we slow down: Family, Friends and Fellowship. The Côte d'Azur smells of perfumed wild flowers, savory herbs, mountain Mistral wind, and Mediterranean shells by the blue coast. Rewind the image to 26 centuries past, as the Greeks are colonizing Massalia (modern day Marseille) an old Ligurian province, around 600 BC. 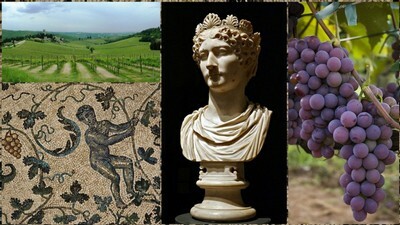 The Greeks bring a wine culture to the area, and by the 4th century BC it was already a major trade post and port, exporting local salted pork, fish, coral, wines, cork, and medicinal and aromatic herbs and plants between the Roman Republic and Gallic France, and traders would follow the Atlantic to the British Isles, and up rivers like the Rhone to trade with Burgundy, Switzerland and as far as the Baltic Sea. In order to protect trade route commodities from incursion from Etruscans, Carthaginians and Celts, by the 1st century BC, the communities of Nice, Arles, Cannes and Marseille had allied themselves to the Republic, becoming the first Roman province outside of Italy, and the area became known as Provincia Romana, dubbed "provincia nostra" ("our province") from which the current name for Provence is derived. The wines of Provence in antiquity were fresh, light, exuberant, and pale in color, as the juice of the grapes was quickly removed from the skins immediately after harvest, allowing for but a very short maceration (grape skin to juice contact) before fermentation. Long maceration times were practiced on a limited basis, and possibly used for tonics, tinctures, or aromatized infusions, much in line with ancient Roman traditions (think bitter Amaros and Vermouth). It is also known that ancient cultures have practiced polyculture (white/black grapes co-harvested and co-fermented at the same time) in their vineyards, a way of blending wine via the vineyard field blend, and thus increasing the chances of pale colored wines. Provence benefited of fame for the quality of their wines across of Julius Caesar's Republic, but it's not until 8 BC that Provence becomes really Romanized under Augustus, building aqueducts, arenas, fora, villas, baths, theatres, monuments, and roadways, now spanning from Hispania's Pyrenees to the Ligurian Alps, now part of the Roman Empire. However, it is after this time from the 3rd to the 5th century and beyond that the propagation of vines via the monastic orders would catapult, as they would make wine not only for the service and sacrament, but also the sale and export of wine to fill the coffers of their monastic establishments, and build regional wealth that would catapult Provence to the highest courts. By 880 Provence had become an independent County, and in spite of neighboring political conflict, the wines of the region remained sought after, and well received along all the lines of extraordinary aristocrats; duchies, and dynasties. The Nobility was the best ancient class of "marketing" as ambassadors, courtiers, and emissaries would often refer to wines from their travels and visits to foreign realms, as royalty does, the rest follow. The wines of Provence gain even further acclaim in the 14th century, as the reign of the French Papacy seats in Avignon, then in the Holy Roman Empire, and as the most important noble families, honored royal subjects, and top officers of the royal armies would acquire and oversee many vineyards in Provence, establishing the foundations for modern wine production in the region. It's not until the late 15th century that Provence legally becomes part of the Kingdom of France, and thrived under the Ancien Régime throughout the Middle Ages. Provence saw its share of trouble during the Napoleonic Campaigns in the post-revolutionary period, as it remained largely royalist. By the 19th century the port of Marseille was monumental in maintaining the French relations with new Franco-African colonies, and in fact, to import wine from Algeria notably, back to France during the plight of Phylloxera that ravaged European vineyards. 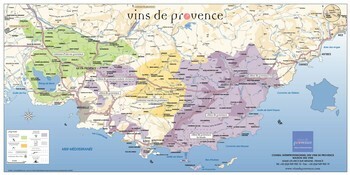 In modern times, unlike all the other regions of the French Republic, Provence's wine production remains roughly about 80% rosé, with 14% red and 6% white. As in ancestral times, the wines are pale gray-pink (sometimes referred to as vin gris) and raging from melon, peach, mandarin, to grapefruit pink-hues, and they retain their bright acidity, perfumed elegance, and fruity aromatics that make the style of Provençal wines a benchmark for rosé wines across the globe today. Not only was Provence prodigious in establishing a wine culture in the rest of Gaul during the Greco-Roman times, and a cast commodity in the royal and papal regimes, but also has been known for a culinary center with their fused Mediterranean cuisine of excellence. Some of the most well known and well loved gastronomic pairings for rosé in Provence are; Salade Niçoise (tuna green salad), Bouillabaisse (fish stew), Anchoïade (anchovy paste), Escabèche (acid-vinegar marinades), Ratatouille (vegetable stew), Aïoli (garlic mayonnaise), but rosé has proven to pair well with many cheeses, charcuteries, poultry, pork, and seafood dishes, fish in general, as well as sushi, sashimi, and other international cuisines that may be more challenging to pair with white or red wines in general, like Thai/Indian and other Asian cuisines, with Peruvian and Mexican gastronomy and American pique-niques like barbecue, hot dogs, hamburgers, and pizza. Speaking of pique-niquin' - as we dawn upon our warm Texas Summer season, rosé wines should be considered for not just cuisine pairing, but the hot weather environment that demands a refreshing wine, as they do in Provence. 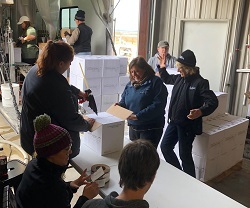 Leading by example, Kuhlman Cellars winemaker Bénédicte Rhyne (who incidentally grew up in Aix-en-Provence), has released the first rosé made under the Kuhlman Cellars label, from Texas High Plains made as a co-fermented field blend of 10% Ugni Blanc and 90% Cinsaut (classically used grapes in the French Riviera) in the 2015 vintage. It is a refreshing wine, with firm structure, and elegant profile, yet fun character. The wine is named “Hensell” after the Hensell Sands found at the Cobb Family Vineyard, a geological formation in the Edward Aquifer in the Texas Hill Country. So, who says time travel doesn't exist? The time capsule is the bottle, as it preserves traditions (some of which have been extremely codified). Travel today in time, share with friends a bottle of Hensell rosé with a rustic bread, an array of cheese and cured meats, a jam preserve, and Kuhlman's signature Spanish Marcona almonds with Herbes de Provence, and reminisce of how the ancient Greeks and Romans enjoyed life by the Côte d'Azur in provincia nostra over 2000 years ago enjoying a similarly refreshing pale pink-hued wine. Hang on to your hats folks – Bud Break is upon us early in 2016. 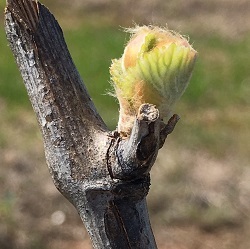 Bud break is when the grapevines wake from their winter slumber and begin the annual growth cycle, hopefullyculminating in a high quality winegrape harvest! It is also the time when all of us winegrowers become obsessed with weather forecasts, temperature predictions and storm tracking. It is a nervous time. Inevitably, the grapes wake up before the last frost occurs and those frosts destroy more grape clusters than pretty much anything else in Texas! Our average last frost date in the Fredericksburg area is March 26. However, that simply means 50% of the final frost events for the year occurred by that date. The 90% last frost date isn’t until about April 14. This is when, historically, 90% of the final frost events have occurred. The grapes awoke early this year. This is because we had an overall mild winter, but also because we had a very warm February. Let’s put things in perspective. Our 2016 bud break was March 7. This is the earliest we have encountered at the family vineyard. And it is the earliest by a lot – last year in 2015, we didn’t achieve bud break until March 24! Bud break in 2014 and 2013 was March 21 and March 15th respectfully. Therefore, March 7 represents about 3 weeks earlier than 2015 and 1 week earlier than our previous record. So far, the weather looks promising. Though the weather isn’t up to us. Instead, we work hard to keep the vines healthy and we stay prepared to take whatever actions we can to protect those tender buds in cases of cold weather. Site selection is critically important to help defend against frost. At the family vineyard, we have nearly 2 miles of clear valley spreading out south of the vineyard along with about 200 feet of elevation drop. This allows the cold air to simply flow out of the vineyard and not settle to impact the vines. As we progress through the growing season we look to transition from risk period to risk period. We start with frost, proceed through hail and ultimately encounter mold / fungus and proceed on to four legged and two winged pests in the form of mammals and birds who want to eat our precious fruit. We don’t breathe easy until the fruit is harvested and in the cellar! With some fortune and very hard work, 2016 will not only see the third family vineyard harvest, but also the first at the Estate. We will see, but hopes are high and optimism strong. What is the first thing that comes to mind when you think of a dusty old cellar beneath a Chateau in France? What is the first thing people want to see when they tour a winery? The answer for most of us would be the wine barrel. Simply put, the oak barrel is one of the single most romantic things to observe in the cellar, they are equally as beloved in regards to winemaking. 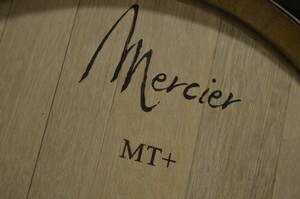 Barrels act as a vessel, a membrane between the wine and the oxygen-rich air outside of the barrel. These metal-hooped, toasted bunches of oak slats, call staves, are oh-so important to the art of making fine wine. Let us take a look into the world of wine barrels, and why they are an integral tool in the cellar. Firstly, why barrel age a wine? A wine barrel acts as a porous barrier, allowing small amounts of oxygen transfer to occur over time. This aspect of barrel aging really helps to achieve structure and marriage of flavors in a wine. Second, it is very common to obtain flavors from a new oak barrel during its first use, typically within the first year or two of a barrel’s life. After such time, the barrel becomes what we call neutral, basically meaning it imparts little flavor into the wine, but the oxidative effect and additional tannins from the wood are still very much present. There are several regions in which we harvest oak, but the two most common would be French and American oak. Each has their own unique personality and offers different characteristics to the wine housed within them. American oak- Harvested from oak in the warmer climate of the United States, this type of wood has looser graining which produces more aggressive flavor profiles. Baking spices, dill, vanilla and toasty flavors are often exuded from American oak. French oak- Harvested from the cooler climate of France, this type of wood offers tighter graining which produces more gentle flavor profiles. Gentle notes of vanilla and toast can be expected from French oak. What about tannins? In wine, tannins come from the skins, seeds (called pips), and the stems of the grape clusters. Did you know tannins also are imparted from the oak barrels? Typically we perceive phenolic tannins from the fruit on the front palate, while the tannin compounds from the oak barrels are often sensed on the back palate. Tannins in general are perceived as astringency all over the mouth, and add a ton to the structural mouth-feel of a wine. Next time you are in a tasting room and are admiring the oak barrels, try and remember how much they add to the finished product in your glass. Let us also give a shout-out to the people that put in the time and effort that went into making a wine barrel by hand. The holidays are a time when giving and receiving can result in a nice stash of wine accumulating in your cellar. If hosting a holiday party, chances are a guest will bring a bottle of wine or Champagne as a thank you gift. Santa may deliver an intriguing bottle of your favorite varietal with a note to not open until Christmas… five years later. Rather than let your yuletide bounty of bottles sit on the kitchen counter, here are some tips for storing the gift of wine all year long. Only 1% of the world’s wines are meant for “long term” storage. The other 99% is meant for consumption between immediate and up to 10 years. 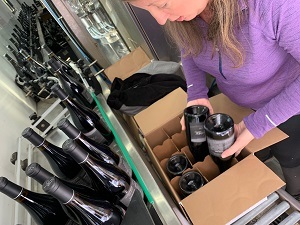 During that time, the way a wine is stored can help preserve the integrity of the product and encourage the long-term chemical reactions happening inside improving it with age. Wines biggest ‘frenemy’ is Oxygen. Oxygen allows wine to ‘open’ when uncorked, allowing a wide range of aromatics and flavors to emerge. Prematurely introducing oxygen for long spans of time degrades and ‘spoils’ the wine. Wines with a high level of natural acidity help slow the oxidation process. . When you cut open an apple, the flesh begins to brown very quickly due to oxidation. Wine undergoes a similar ‘browning’. High natural acidity in wine helps slow the oxidation process much like lemon juice stops oxidation in fruit. Tannin levels also help prevent oxidation. Tannins act like a “shock absorber” to process oxygen in a way that allows other chemical complexities to not bear the full brunt of exposure. Tannins are primarily gained from extended contact with the seeds of the grape and barrel aging. Storing wine properly allows tannin chains to be “used up” or broken, giving aged wine a softer, more nuanced body. 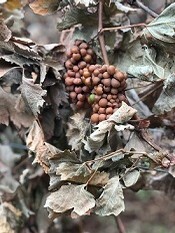 White wines do not have the same exposure to the seeds and barrel age resulting in low tannins and a generally a poor candidate for long term storage. Try to consume white wines within three years of the date on the bottle for best results. Find a cool place: Ideally wines should be cellared at 65 degrees. 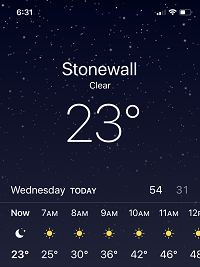 But here in Texas, following the rule of not exceeding 75 degrees is more practical. Find a spot that provides a stable temperature level and avoid wild heating and cooling fluctuations. 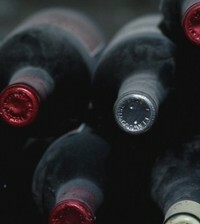 Wines stored in excess of 80 degrees can ‘bake’ in the bottle causing heat damage. Find a dark place: UV light rays are damaging to wine. Find a shaded space away from direct sunlight. Green or brown or bottles act as a UV filter, but prolonged UV exposure will harm the liquid in the bottle. Bad Vibes: There are tens of thousands of complex chemical reactions happening in a single bottle of wine. Vibrations can speed up or deter these reactions from happening. Keep your wine collection away from heavy machinery like washers and driers, climate control systems and vehicles. Going Sideways: Bottles should be stored on their side to maintain contact between the liquid and natural cork. Because cork is porous, it can contract when dry and allow unwanted oxygen into the bottle. For this same reason, don’t allow corks to dry out. Keep your wine in a place where fresh, humid air can maintain the natural sponginess of cork. One item not on the label of a bottle is how long it should be stored for. Price point can be an indicator of how long a wine can sit before consumption. The majority of wines that price under $30 are meant to be drunk within 1-5 years after the vintage date. Wines between $30 to $100 are meant to age for 5-10 years of the vintage date, though there are many exceptions. The quality of the bottle and cork can offer subtle insight as to whether the winemaker chose to invest in the longevity of the juice. Keep in mind that long term aging is not a benchmark for quality. Many highly praised wines are not meant to age past 10-20 years; the chemical composition simply does not hold up over time. The lack of prolonged cellaring possibilities does not impact the quality of a wine consumed within its proper stored lifetime. National magazines and wine websites often note wines with the potential for long-term storage. When looking for a wine gift (or a gift for yourself) with delayed gratification in mind, consult these resources so you can buy now and enjoy later. If you are looking to shop for local this holiday season consult The Texas Wine Journal for guidance with Texas grown and produced wines. The Journal offers ratings and descriptions compiled from a panel of professional sommeliers after tasting the wines blindly by category. 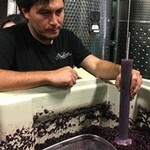 You can find more information about the journal at TexasWineJournal.org. Happy Holidays and safe imbibing!